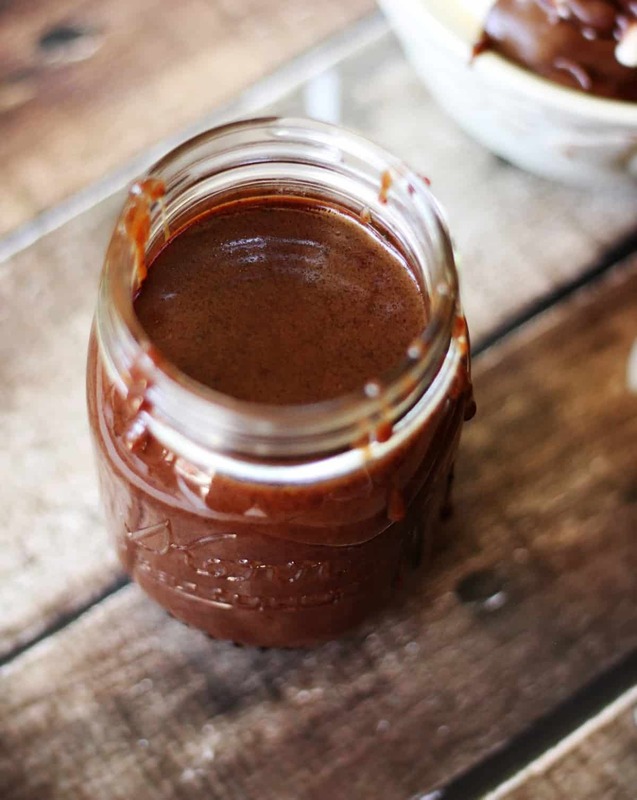 Warm, chocolately fudge sauce perfect for topping smearing or drizzling on any of your favorite desserts. Remember how I said even though I’ve developed a fondness of fruity desserts, I still completely adore chocolate? 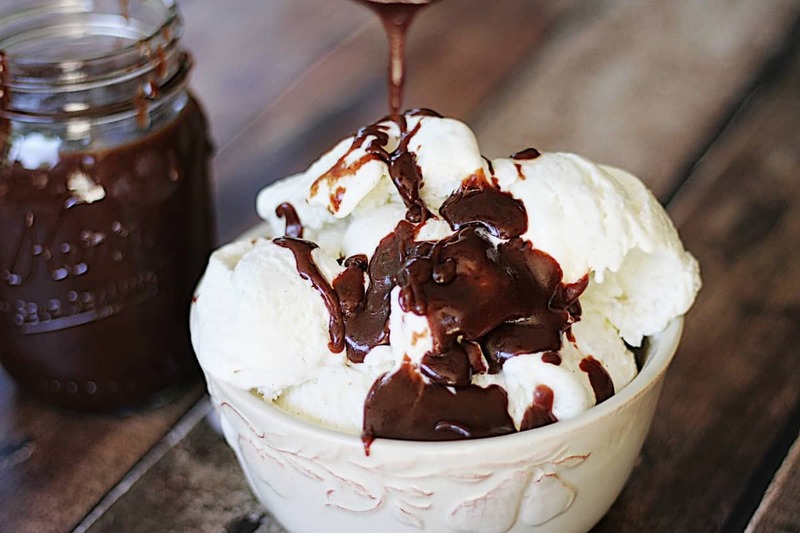 One can never have too much hot fudge sauce, right? 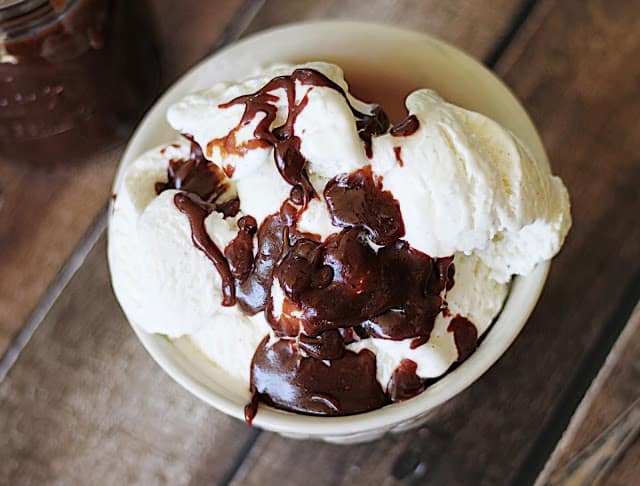 I could probably put hot fudge sauce on just about anything but my very favorite is a big fat bowl of cold hard ice cream. There is just something about that hot-cold combo that just gets me. I’m big fan of pairing opposites when it comes to flavors and foods. Like salty-sweet, and hot-sour, and creamy-crunchy. Whenever I have hot fudge sauce these days I get some freshman-year nostalgia. 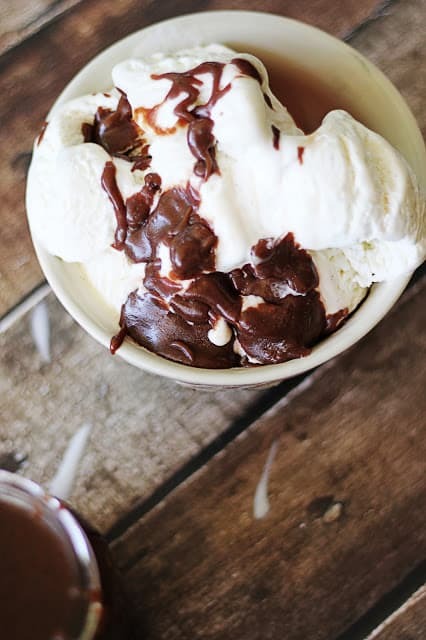 When I would shamelessly pile hot fudge sauce on top of my BYU Creamery chocolate chip cookie dough ice cream. If you haven’t had BYU Creamery ice cream, you are seriously missing out and need to but it on your culinary bucket list. Annnnnnd now I’m craving it really really badly. Good thing it’s only an hour away from me! Do you think I could get it home before it melts?? Ah! An cooler! I’m totally packing one with ice and making the trip. So worth it. 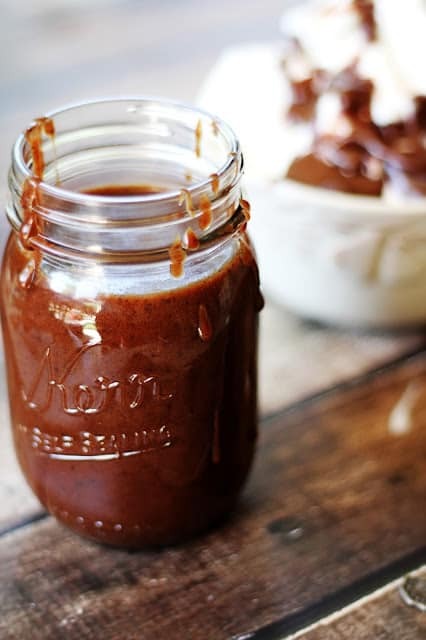 And this time around I’m drowning it in my hot fudge sauce! Just a little disclaimer: this stuff is RICH and ooey gooey messy wonderful. Just a heads up! 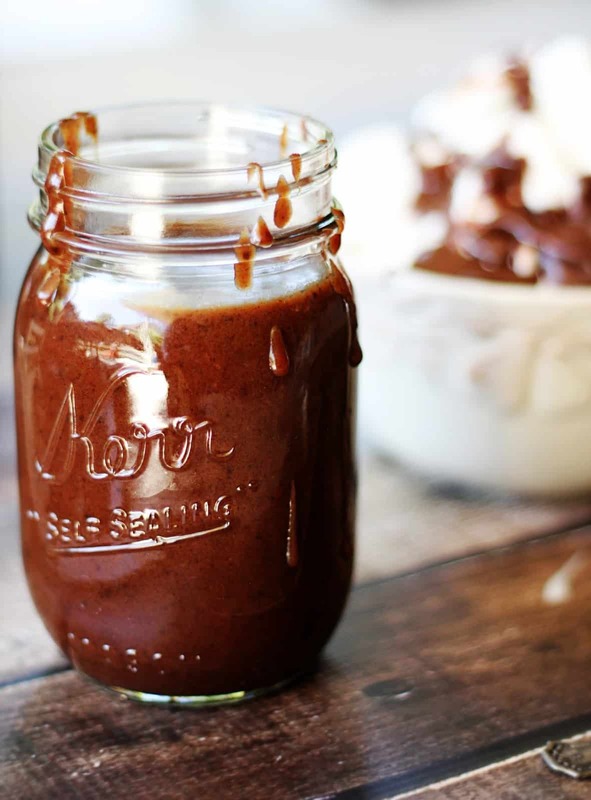 *Oh, and keep an eye out, I’ve got some super tasty recipes to pair with this amazing hot fudge sauce coming up for you in the next few days that will blow your mind!! In a large sauce pan combine all ingredients except vanilla and bring to a boil. Reduce to medium heat and allow to boil 8-10 minutes, stirring continuously. Remove from heat and add vanilla. Serve hot. Store in an airtight container 2-3 weeks (reheat in microwave when ready to serve). Fantastic idea. Speaking for my kids, we can’t wait to give this a try! Ha ha Thank you Dan! I hope you and the kids love it!! Wow, this looks amazing! Pinned! Oh dear, this looks incredible! Thank you Heidi! I’m kind of obsessed… I’ve been putting it on and in just about everything!! 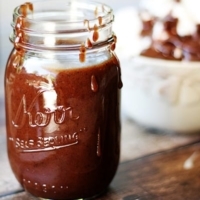 Never could there be too much hot fudge sauce, this looks fabulous! Thanks for linking up with What’s Cookin’ Wednesday! Really though, I think I need a river of it to supply my never-ending craving for it! Thanks for stopping by and commenting Karly! This looks yummy. Found you over at Anyonita Nibbles ~ Tasty Tuesdays. Pinning this. Thanks so much Marlys! So glad you stopped by! Found you on Anyonita Nibbles. This looks amazing. I’ve already pinned!! Thank you so much Roxanne! This stuff is soooo yummy! Thanks for stopping by and pinning!! Delicious! 🙂 I cannot wait to make this! I’m imagining it over your devilish cheesecake ice cream! Thank you so much for linking up with me this week at Tasty Tuesdays! I’ve pinned this & shared it with my followers! Please be sure to stop back by the party and check out some of the other links! I’ve just posted my Tasty Tuesdays link party on my blog & wanted to tell you that this recipe has been featured! As a featured participant, I’ve started following you in as many ways as possible.You can find the feature here: http://anyonitanibbles.blogspot.co.uk/2013/07/cute-clever-treats-for-kids-paleo-kids-snacks.html Don’t forget to grab our features button and link up again!